Overview: Around the world, multimodal transportation design is evolving. These hybrid structures are evolving infrastructure and its position in a global economy; more urban and more dynamic, these structures are the connecting tissue of the urban fabric. 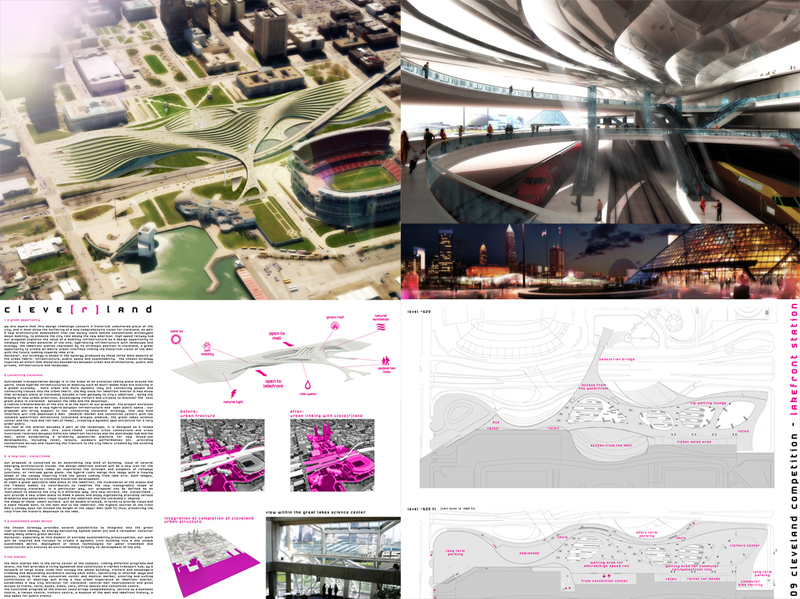 The winning proposal of the 2009 Cleveland Design Competition, titled ‘CLEVE[r]LAND’, explores the value of mobility infrastructure as a design opportunity to catalyze the urban potential of the site – hybridizing infrastructure with landscape and ecology. This new Lakefront Station, represented by its strategic position in Cleveland, is a great opportunity to create a macro-urban interface linking the historical vision of the Mall with a future looking towards Lake Erie. The winning design for Lakefront Station would be a new icon for the city. The architecture takes as inspiration the design of the railway lines, and merges it with the flowing shape of the waves off Lake Erie; both images, symbolically related to Cleveland’s historical development. The roof of the station becomes a part of the landscape. Designed as a raised continuation of the Mall, it creates functional relations between the different Lakefront facilities to the Mall, while establishing a primarily pedestrian platform for new mixed-use development. The roof becomes a new urban place to pause and enjoy the various dramatic and panoramic views toward the Lakefront and the city skyline, repairing the fracture created by the existing railway lines. The chosen strategy provides several possibilities to integrate into the green roof-terrace canopy, an energy harvesting system (solar pv) and a rainwater collector. Moreover, especially at this moment of extreme sustainability preoccupation, the project will be focused to transform a dynamic civic building into a unique sustainable device. The main station hall is the nerve center of the complex, linking different programs and levels. Using a large network of voids that occupy the entire building, the main hall provides a living dynamism and constitutes a vibrant transportation hub.